Stephen Hawking is at it again, saying it’s a “near certainty” that a self-inflicted disaster will befall humanity within the next thousand years or so. It’s not the first time the world’s most famous physicist has raised the alarm on the apocalypse, and he’s starting to become a real downer. 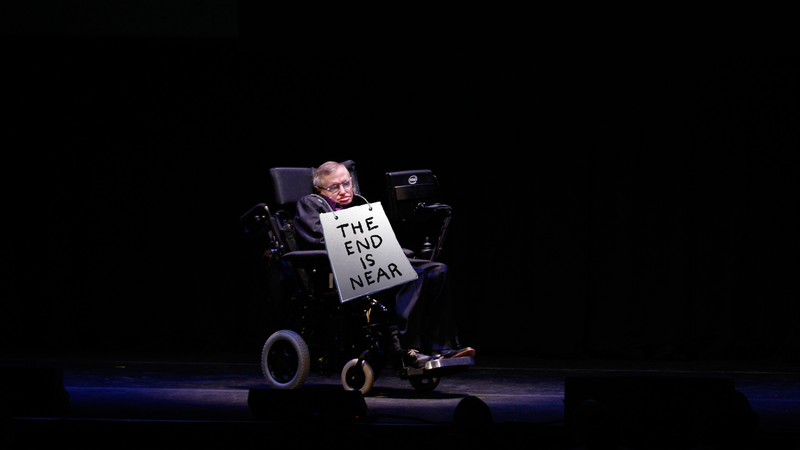 Here are some of the other times Hawking has said the end is nigh—and why he needs to start changing his message. Speaking to the Radio Times recently ahead of his BBC Reith Lecture, Hawking said that ongoing developments in science and technology are poised to create “new ways things can go wrong.” The scientist pointed to nuclear war, global warming, and genetically-engineering viruses as some of the most serious culprits. Hawking is starting to sound like a broken record. Sure, he claims to be an optimist about humanity’s ingenuity in coming up with ways to control the dangers. But he has no problem coming up with all these ominously specific, horrible things that could happen to us in the future. He’s not wrong to highlight these risks—but in terms of what we’re actually supposed to do about, his answers are frustratingly simplistic and opaque, in sharp contrast to his predictions of doom. We only have to look at ourselves to see how intelligent life might develop into something we wouldn’t want to meet. I imagine they might exist in massive ships, having used up all the resources from their home planet. Such advanced aliens would perhaps become nomads, looking to conquer and colonize whatever planets they can reach..... If aliens ever visit us, I think the outcome would be much as when Christopher Columbus first landed in America, which didn’t turn out very well for the Native Americans. To be fair, Hawking is the world’s most famous scientist, so anything he says is bound to get extra media attention and scrutiny. And his ideas haven’t been emerging from a vacuum (or a black hole, for that matter). Over the past 15 years, an increasing number of European scientists—many of them based in the UK—have become concerned about so-called “existential risks.” While once the ruminations of alarmist Chicken Littles, the subject has now crept into academia and formal institutions. Oxford philosopher Nick Bostrom kicked it all off in 2002 with his highly influential paper, “Existential Risks: Analyzing Human Extinction Scenarios.” Bostrom argued that accelerating technological progress is shifting our species into a dangerous—and potentially insurmountable—new phase, with emerging threats that “could cause our extinction or destroy the potential of Earth-originating life.” Since the paper’s publication, the term “existential risks” has steadily come into general use. Sir Martin Rees giving a TED talk: Can we prevent the end of the world? In 2003, esteemed physicist Sir Martin Rees published a book on the topic: Our Final Hour: A scientist’s warning: How terror, error, and environmental disaster threaten humankind’s future in this century-on earth and beyond. Another influential book came in 2008, Global Catastrophic Risks, which was edited by Bostrom and Milan M. Cirkovic. In Britain, the potential for existential risks is being studied by philosophers, scientists, and futurists at Oxford’s Future of Humanity Institute, and at the University of Cambridge’s newly minted Centre for the Study of Existential Risk. The subject hasn’t really gained much traction elsewhere, though it is a concern of the US-based Institute for Ethics and Emerging Technologies. So Hawking is clearly not alone. But he happens to occupy a unique position from where he can proclaim his warnings about the future and potentially influence our response. The problem is in having such a highly respected figure continually spout these grim proclamations without also offering viable solutions. By doing so, he’s perpetuating a defeatist attitude, and even a certain degree of misanthropy. Clearly, it’s important to get the word out before it’s too late, but it’s not enough to just be the bearer of bad news. Moving forward, let’s hope he can use that big brain of his to come up with something more productive.